What is Living Lessons Library? How did I get "Out" of the Matrix? How do we say No Thanks to 5G? I bought the domain name "Living Lessons Library" in 1993. This is when I came into the understanding that our planet and our relationship to Earth through our DNA is actually a library of living lessons, and the library itself is alive, and a living lesson within creation. A few years later, someone offered $10,000 for the domain name Living Lessons.com. I turned them down. Awhile after that, the company where the domain was registered didn't advise me that the domain registration was about to expire. Supposedly, back in those days the domain was never to expire. So I then secured the domain living lessons library dot com, and began blogging under than name on Wordpress.org. In 2007, my blog posts focused on how manipulated human beings are in the various sociopolitical arenas in which we live. I blogged about the dangers of losing our privacy through use of cell phones and the Internet. Nobody paid any attention. It was too early in the game. Here we are ten years later. Today, Living Lessons Library is still devoted to human accelerated, organic evolution and to understanding the value and importance of our organic genetics which are mutating --- NATURALLY. 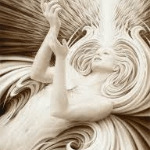 One of my highest priorities is protecting this organic transformation of human beings in a 5D spiritual realization of interconnected hearts. This is so different from what is planned through the impending frequency imposition of the 5G roll out. 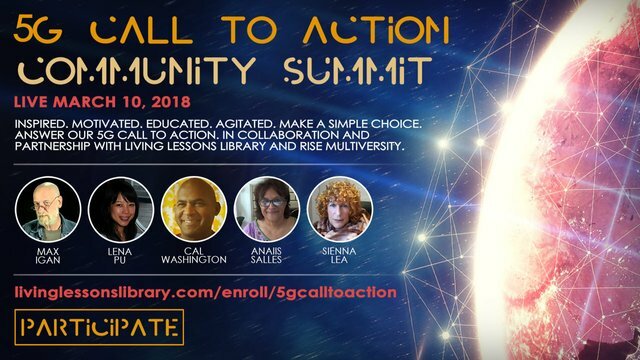 I am thrilled to be collaborating with Rise Multiversity.Org and one of our first guests for our March 10th 5G Call to Action Community Summit. Come and find out about 'smart' meters and how you can opt-out of being forced to use a smart meter on your home. Thank you, Max Igan of The Crowhouse and ImPower's Cal Washington and Lena Pu for taking time to educate and inspire us to take action. March 10th 2:00 - 4:00 pm EST. Protect your health and assert your personal sovereignty. Here's the link to register for the free (donation appreciated) event. You got a 18.18% upvote and resteem from @ebargains courtesy of @greatestjourney. Thank you for using the @ebargains UPVOTE and RESTEEM bot. You will earn 80% of the voting bot's earnings based on your delegated SP's prorated share of the bot's SP pool at the end of EACH voting round! That is over 38.5% APR! You can also undelegate at anytime. This post used the @earthnation tag. Earth Nation is a Planetary Alliance of cooperative businesses and humanitarian organizations creating decentralized/ethical alternatives. Into new paradigm, conscious focused, humanitarian, spiritual, or pro-active solutions? Join like-minded souls and let's build a better world. Congratulations @livinglessons! You received a personal award!